When selecting a display, it is important to consider the "information volume" of the medical images that will be displayed. 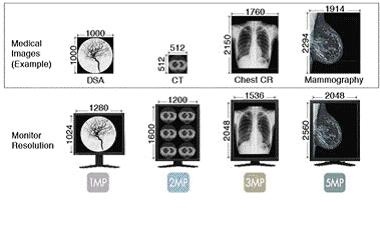 For example, a 1MP monitor can display 4 slices of CT which has the information volume of 512 x 512 pixels, and 2MP monitor can display 6 slices, 3MP monitor can display 12 slices without losing any of the information. However, the chest CR which has the information volume of 1760 x 2150 pixels can only be displayed partially with 1 or 2MP monitors. Thus, in order to display the full image, the information must be stretched causing a thinning effect of the image. Using a 3MP monitor, the image can be displayed fully without the information being thinned-out and causing a loss in image quality. The "information volume" of the medical image differs depending on the modality which creates the images. With RadiForce medical display monitors, you may select the optimum monitor which is suited for the information volume of the medical image you need to display. Copyright © 2008 EIZO NANAO CORPORATION. All Rights Reserved.